In full comfort mode. 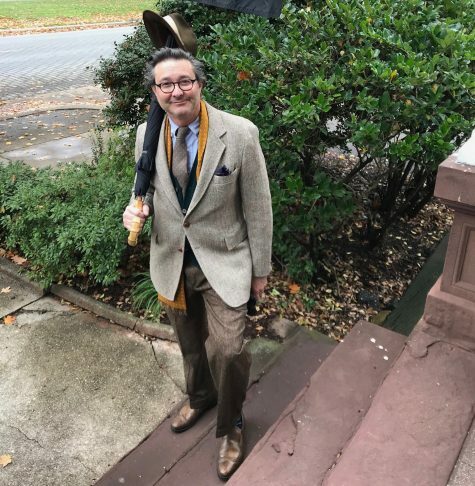 Harris tweed, half-lined sportscoat (vintage), BB OCBD (ancient), A Suitable Wardrobe woolen tie, RL cashmere sleeveless cardigan, Leviner Wood custom Donegal tweed trousers, and AE slip ons. Hat” Borsalino (venerably ancient), Whangee handle stick umbrella BB. Silk scarf: Robert Talbott, gloves: RL. Pocket hank: Drake’s. Specs: Tom Davies. This entry was posted in Uncategorized and tagged A Suitable Wardrobe, Allen Edmonds, Borsalino, brooks brothers, Donegal tweed, Harris Tweed, Leviner-Wood, Ralph Lauren, robert talbott, Tom Davies. Bookmark the permalink. 4 Responses to Leaving Leviner Wood After a Great Meeting. Wow Chris, that ensemble is just outstanding. I think I have similar items in my wardrobe so I hope you don’t mind if I treat my students to an example of your sartorial excellence. You have been such a great influence over the years. Thanks once again. I am now at the end of my teaching career, at least in its present form. Next term I will be a student once again to start my next and probably last career. Of course, while sitting on the other side of the lectern, I will have to temporarily rethink my clothing style. Dressing in the middle ground as you so aptly put it, is a weak point for me. It will be a new challenge to try to look elegant while dressing as a student. I must add though that it will be a fun challenge. Thanks Todd! Congratulations on your next phase. I mine instagram and find inspiration there. It doesn’t take too much thought if you know color and texture. Then it’s a question of comfort. Flannels, khakis, cords, moleskin, and even denim can go well there. Shoes are important. Desert boots go everywhere. A good chambray shirt or two will become your go-to. Chris, today I recreated your outfit above and a young woman whom I had never previously met approached me in the hallway to complement me on my outstanding style. She said it was much appreciated to see a man dressed like me. Of course, that was your style, so thank you so much. Todd, And that, sir, speaks volumes. Way to carry it off!